My name is Boie . I am a mature gentleman and I have 3 increasing hobbies. One of those is repair and sale of computers. This has had my interest since 1977, this was before hard disk, DOS and floppy drives were on the market. Therefore do you have a computer problem - do not hesitate to mail me. My second hobby is motorbikes. My 3third hobby is to collect of old photos and postcards of transport vehicles especially motorcycles, so if you have some, do not hesitate to send me an mail from the front of my homepage, thanks. My first bike was a NSU Consul 500 ccm from 1953 at DKK 300.00 running. The next was an Indian Big Chief 1200 ccm from 1947 for which I paid the incredible amount of DKK 900.00 and it was running. One of my friends from the old Harley-club owns it today. However he finds it hard to ride it in a decent way. Once in a while he things it is a racer (here.. Greger, take that) no - joking apart he treats the old lady very well. Later I have ridden several of English bikes such as Triumph, AJS, Matchless, Norton and even a Nimbus. My first Harley I got in 1977, it was a WLC from 1942 for which I paid DKR 3.500 running. I painted an rebuilt it and 2 years later I sold it for DKR 32.000 this was the right time to sell as the prices were increasing. I also have an Mw/K 750 military bike, which has run in the Polish aircraft. 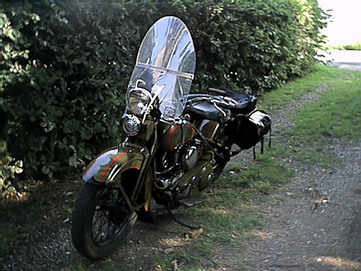 It is supplied with reverse gear operated by a handle at the fender there also is direct drive at the sidecar. Please note the picture at my welcome page. Then I have a Service car (also for sale) that is a 3 wheeler Harley Davidson, not quite finished as it has not been assembled, but motor and gearbox are rebuild, this one also with reverse gear. Further more I have an M72 with sidecar from 1957, an Ural 1989 also with sidecar and reverse gear, so obviously I have a from sidecar freak, and I also have a DKW from 1953 assembled, but could need a hand.Finally I have a BMW R20 from 1936 with engine rebuild and fender, frame, shields and wheels are fixed and painted.